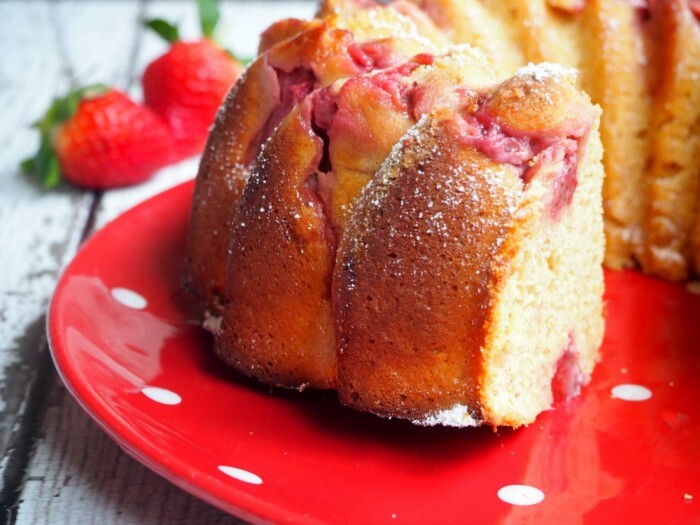 This beautiful bake comes to you courtesy of cheap strawberries and some leftover yoghurt. 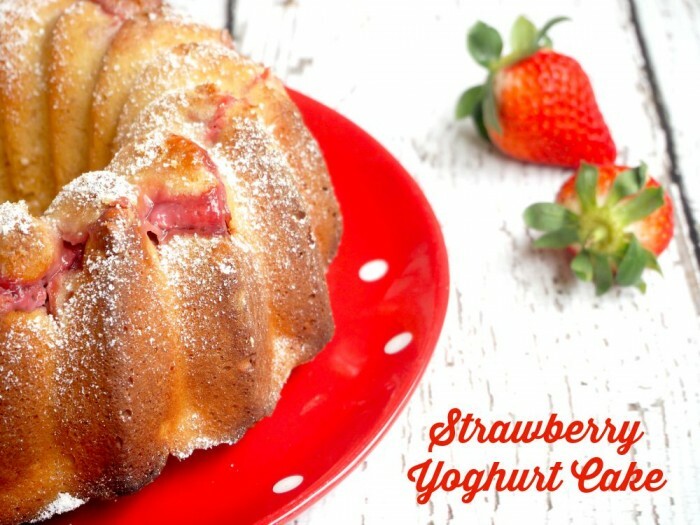 The yoghurt, combined with the almond meal give the cake an incredible texture, while the strawberries add some uber moist deliciousness. Apart from anything else, it just looks so pretty and like our favourite sports teams, red and white is always alright! You’ll find the traditional and the Thermomix recipe here, but whichever way you make this cake, I promise you it will be berry nice! Mix flour, almond meal, baking powder and salt in a medium bowl and set aside. In another large bowl, mix the sugar, oil and yoghurt with a wooden spoon. Add the dry ingredients in three or four additions and stir until just combined. Don’t over mix. Pour half the mixture into the bundt tin and top with half of the strawberries. Add the remainder of the batter and top with the remaining strawberries, gently pressing them into the mixture. Bake for about 35-45 minutes, or until the top is springy and a cake tester inserted into the cake comes out clean. If it’s browning too quickly, cover with foil. Allow to cool in the tin (at least 30 minutes – patience is a virtue!) Serve warm or at room temperature dusted with icing sugar. Add flour, almond meal, salt and baking powder to TM bowl and mix for 10 seconds on speed 6. Set aside. Add the sugar, oil and yoghurt to TM bowl and mix for 5 seconds on speed 4. Scrape down sides. Add eggs one at a time, with the blades running on speed 3. This will take about 1 minute. Add the dry ingredients in 3 or 4 additions, mixing for 5 seconds on speed 4 each time. Make sure the bundt tin is really well-greased and lightly flour the tin before pouring the mixture in. Don’t use Extra Virgin Olive Oil because it’s expensive and it has a strong flavour which can overpower the cake. If you have a Thermomix, you can mill your own almond meal. Simply add 55g almonds to TM bowl before you start and mill for 10 seconds on speed 8 or until fine.